King and Queen of the Hill Titles Belong to Belen and Ferguson! Video Coverage by Julian Herrera - Watch all four races!! Photo Album by Teri Bernhardt-Rodriguez - Over 1,000 photos!! 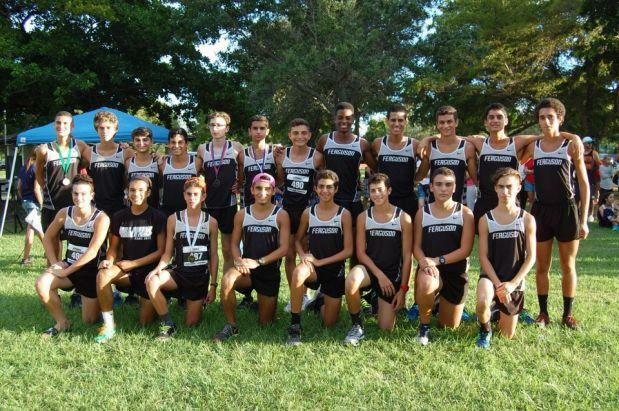 The second annual King of the Hill Cross Country Invitational took place again in Miami's Tropical Park and it was another great event, even better than last year! From live music, to original awards, to the fantastic atmosphere provided in the venue, this looks to be a large South Florida meet that will continue to grow in the future! Co-hosted by Christopher Columbus HS and Our Lady of Lourdes Academy, with help from local sponsors Total Bank and SoleRUNNERS, the meet ran very smoothly without any issues, except the occasional dehydrated runner, but that's just part of the game. Stay hydrated everyone! 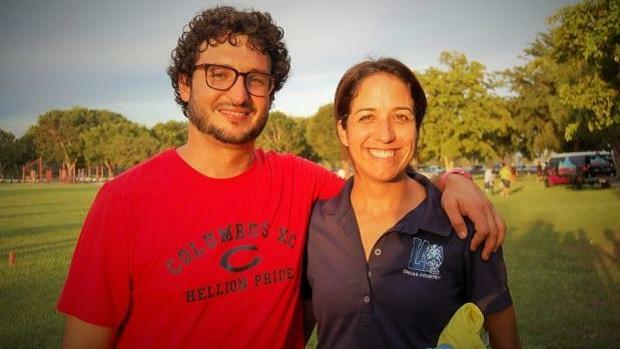 Co-Meet Directors and Head Coaches, Eric Pino of Christopher Columbus and Rebecca Rodriguez-Michalak of Lourdes Academy. The girls JV race was by far the best weathered race of the day. As the storms moved away they left a nice bit of cloud cover which allowed for some amazing race conditions as the meet kicked off right around 3:45pm. The race shaped up to be another major Lourdes show just like last week was, except they were even stronger as they were having a race off with some of their girls in varsity contention; in fact, their top three JV girls would have been their #1, #3, and #5 had any of them ran in varsity. Followed behind Lourdes was strong packs by Ferguson and Miami Country Day. Nine of the Top Ten Girls JV Individual Finishers. Fifth through first on the top, ninth through sixth on the bottom. 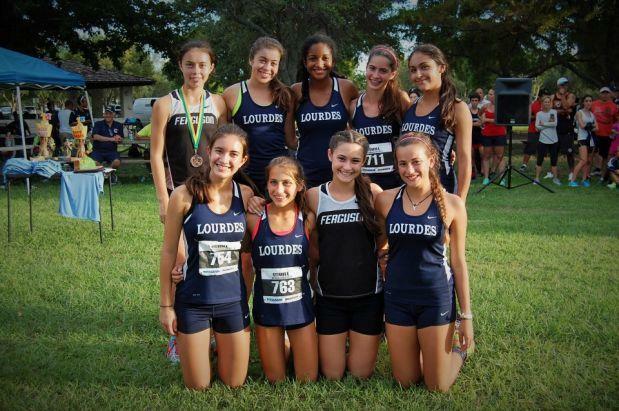 The Girls Junior Varsity Team Champions from Lourdes Academy. As the boys JV race got underway, the clouds started to disappear and the typical Miami weather came into form. However, this didn't stop the JV boys from taking it out hard and putting together some very solid performances. 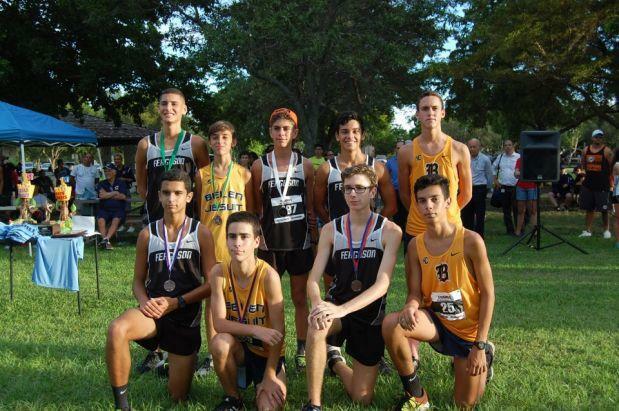 The individual champion from Belen completely broke away from the field and won by a margin of 50 seconds over the next fastest competitor. 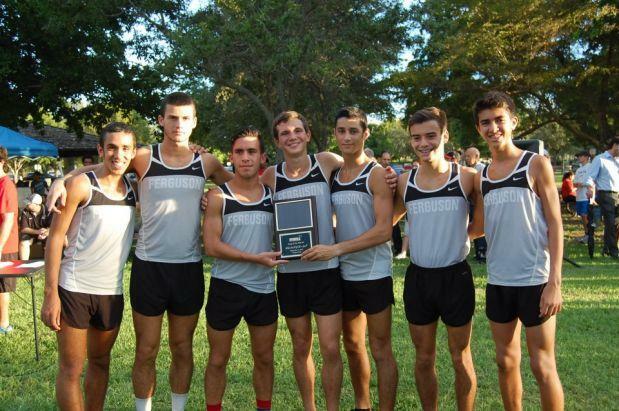 He was initially followed by many of his teammates through the first couple of miles, but a strong Ferguson pack made up the distance in the last mile to pick up the win as they placed six finishers in the top eleven overall. Nine of the Top Ten Boys JV Individual Finishers. Sixth, fifth, and third through first on the top, tenth through fifth on the bottom. The Boys Junior Varsity Team Champions from John A. Ferguson HS. 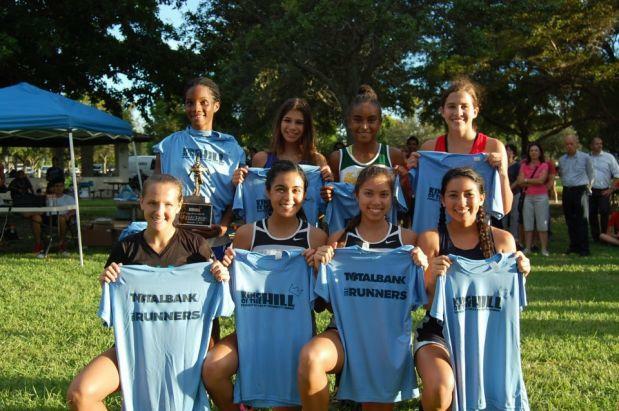 In the individual race it was a heated battle for the majority of the time between Brittany Gill of Dillard and Natalie Varela from Gulliver Prep. Although they were shoulder to shoulder for much of the race, Gill made a couple of strong moves to get a slight lead which she used to push away with in the last mile or so. As a senior making her XC debut, her impressive meet record time looks to be a big indicator for an amazing season this year. In the team race, it was another tight battle between Ferguson and Lourdes this week, and although Lourdes had the better pack and spread, Ferguson picked up the win as they placed three inside of Lourdes' top finisher, with their four-five-six right in the mix as well. 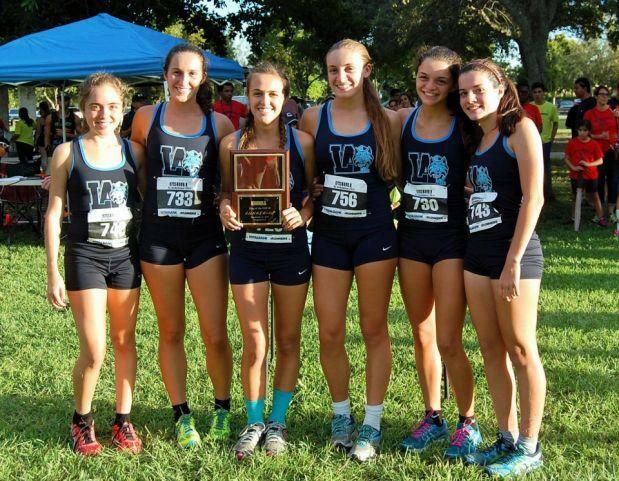 Eight of the Top Ten Individual Girls Varsity Finishers. First through fourth on the top, with sixth and eighth through tenth on the bottom. The Girls Varsity Runner-up team from Lourdes Academy. 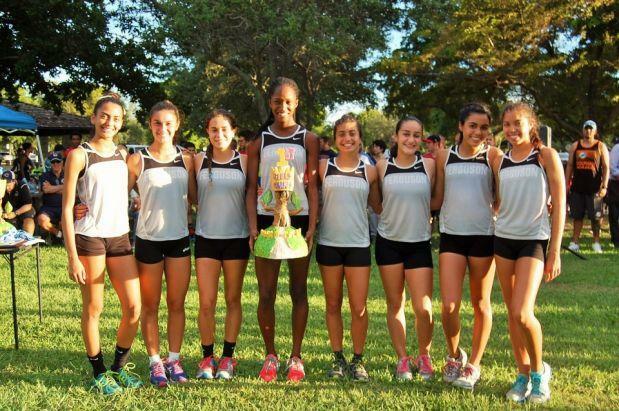 The Girls Varsity Team Champions from John A. Ferguson HS. The final race of the day was one of the hottest, yet it did not stop the lead boys pack from blasting the first mile as they opened up right around the 4:50 mark. Many paid the toll later in the race, but after a rare defeat last week, Carlin Berryhill showed his strength, coming off of illness, over a Belen 3-pack that finished in the three places behind him. 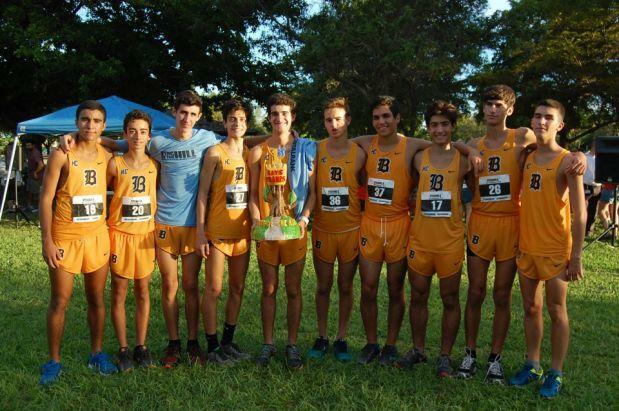 The Belen strength up on top, three runners inside everyone else's #1, was more than enough to gap every other team. Ferguson was able to pick up the runner-up honors as they placed four runners inside of the Columbus #2 finisher. The Top Ten Individual Boys Varsity Finishers. Fifth through first on the top, with tenth through sixth on the bottom. The Boys Varsity Runner-up team from John A. Ferguson HS. 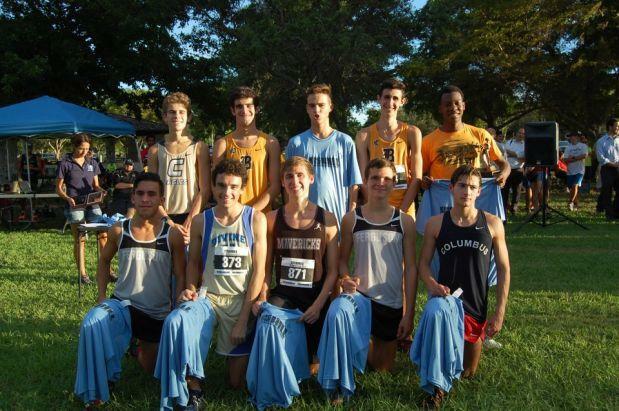 The Boys Varsity Team Champions from Belen Jesuit Prep.